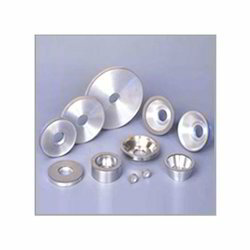 Metal Bond wheels are meant for high resistance to wear applications and tend to give particularly long life. The use of coolant for metal bonds is a must. In exceptional cases of small contact surfaces, dry grinding may be employed A comprehensive range of products conforming to FEPA Standard are offered from 6mm to 700mm in diameter. We are counted among the reputed business entities, engaged in manufacturing the best quality range of Diamond Plate Wheel. It is available in all sizes. Wheels with segmented for the first heads of polishing machines for grinding hard stone and agglomerate. We offer Metal Bonded Wheels that is widely demanded by various industries like ceramic & stone, engineering and automobile. 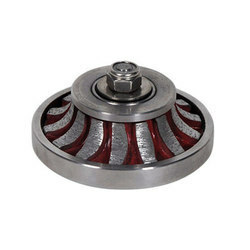 We are one of the leading manufacturers, exporters and suppliers of metal bond wheel of superior quality. These Metal bond partning wheels 1A1 are mainly used for cuting tungsten carbide tips. The specialty of Metal Bond wheels are high resistance which gives long life to wheels. Experience and expertise in metal bond products produce excellent result on specific applications. These wheels are engineered to perform better and give high precision result.